Once upon a time I went to a show and it was called A Brown Bear, A Moon, and A Caterpillar. And it was about three different books that Eric Carle made. In this one it was: The Very Hungry Caterpillar, Papa, Please Get the Moon for Me, and Brown Bear, Brown Bear, What Do You See? Most of his books are board books, but I still like them. Everybody still likes them even if they are aimed for younger kids. This show is also aimed at younger kids, but I still liked it a lot. They kind of made it like one of Eric Carle's own books. And parents should see it as well, and almost everybody would like it. If you are evil, then you would not like this show at all because it is super fun and if you are evil you usually don't like fun things. Evil people usually have a very bad sense of humor; actually, they have terrible sense of humor. This show is all puppets; there are no humans in it. Well there are puppet humans, but there are no actual humans that you can see. You cannot see the puppeteers because 1) They have very good lighting in this theater, and 2) they have very big puppets that hide them or they are behind a curtain or something, and 3) they are dressed all in black. They even have black masks on. Then you feel like you are actually seeing pictures move and come alive because you cannot see anybody holding on to the puppets or having their hands inside them or strings. The kids thought it was funny and awesome and cool that the Caterpillar had come to life. This play you can take a baby to, because it is a "no-shushing play," and "no-shushing play" means you have to turn off your cell phones but you can talk during the show. It is a good thing to have a show you can take babies to because then babies don't feel left out. A baby would sometimes sleep through it but sometimes be intrigued by this Bear and this Caterpillar and this Moon trying to say something about "we are real" to you. Babies really like bright colors, and Eric Carle uses very bright colors, so babies would like this show. 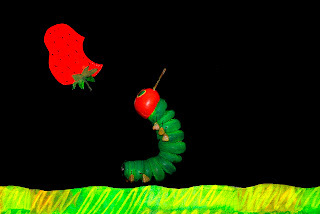 I really liked The Hungry Caterpillar story because it was really funny and I thought it had cool elements to it. One of my favorite parts that was funny was when the Caterpillar would kick his food away and it would just go tumbling away. Some of the cool elements were the Caterpillar was made with foam like from couches and chairs that you might be sitting on while you are reading this. It enabled them to make it slink around like an actual caterpillar. The chrysalis, it unravels slowly around the Caterpillar, then it comes out as an enormous, big-as-the-stage beautiful butterfly. The food was eaten; so he would slide and slide until he got to some food, and he would put his head by some fruit, and a door would open which he would slide through. The Caterpillar didn't talk to you, there was just a voice that would tell the story. The story was exactly like the book. It wasn't an adaptation, it was an adapt-everything. An adapt-everything is like an adaptation only everything is exactly like everything. It was amazingly true to the book, only it was a play because the puppets moved around. I thought Brown Bear, Brown Bear, What Do You See? was really cool. I thought it was really cool because it had so many puppets in it. It wasn't very much like The Very Hungry Caterpillar because 1) the Very Hungry Caterpillar was smaller than all the puppets in the Brown Bear piece, 2) you could see the puppeteers more because they didn't have anything to hide behind. There was one similar thing; all of the puppets were rod puppets. I really like puppets and to see the puppets come alive. I really liked the Purple Cat because it was so jazzy. I even got a pin of it afterwards--that's how much I liked the Purple Cat puppet. It was true to Eric Carle's design in a way that is fun and exciting. 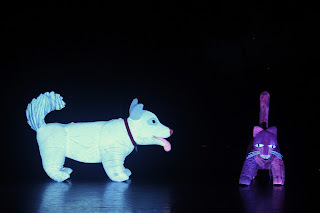 I really liked the White Dog because it seemed to light up because it was so white and they were putting ultraviolet light on it. It lit up so brightly that it was really intriguing. I really liked the Frog because it was so toad-ally toad-ally toad-ally cute because it was so tinier than the others. The Brown Bear was about the size of two toddlers, and the Cat was about the size of one toddler, and the Frog was about the size of a baby. They were telling the story of different animals meeting each other and how they react to each other. It is a fun and scientific story because it is trying to say that different kinds of animals get along and different kinds of animals don't get along. For example, the Purple Cat and the White Dog don't really get along at all. The Red Bird and the Yellow Duck got along because they are basically both the exact same species. Papa, Please Get the Moon for Me wasn't one of my favorites, but I still liked it. I don't like Eric Carle's designs for humans as much as I like his animals. This one was almost all humans, except for a monster/animal/moon. They also used projections. I thought using projections was a cool idea because it was twinkly--it gave a cool look to it, but I didn't like it as well as the puppets. I really liked at the end how they would take questions and actually answer them and not just be like "Oh, that's a secret." I went to go and see another show a few days ago, and it was a really good show, but at the end he said, "Just ask me any question about the show, and I can answer it for you." But then he wouldn't answer some of the kids' questions. He would just say "That's a secret!" It is useful to kids to know how things are done because then when they are older they can make them with their children or with their mom or their dad. It doesn't take away the pizzazz of the story because if puppets are real-looking and they don't seem fake then you will imagine that they are actually real even when you know they are not. People that would like this show are people that like bright colors, no-shushing plays, and Eric Carle. This show is fun, pretty, and terrific. I think this show should be for ages babies and up. I think people should go with at least one kid or baby because that makes the show more fun because then you get to see somebody enjoy it a lot and having lots and lots and lots of fun.